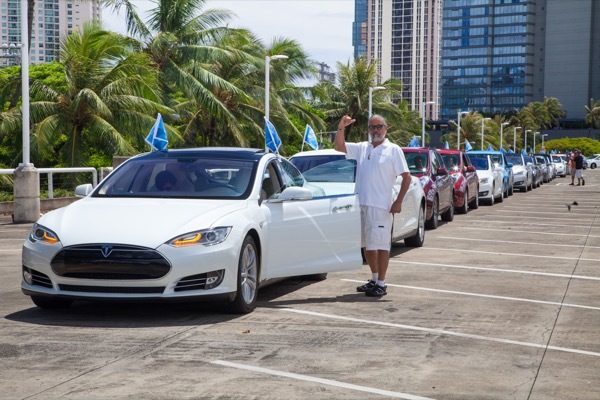 Blue Planet Foundation is proud to host the first annual Electric Island Drive, a caravan-style social drive for electric vehicles in Hawaii, on September 10th. Participants will gather with their EVs in small groups at various locations on the island at 12:00 pm. The vehicles will depart at coordinated times and follow predetermined routes that merge together as one large group to drive past the World Conservation Congress at the Hawaii Convention Center and through Waikiki, ultimately terminating at Kapiolani Community College. The event will culminate with an Electric Island Drive Reception from 2:00 - 4:00 pm in the Kapiolani Community College parking lot. Light pupus and drinks will be provided. All participants will receive thank you gifts and will have a chance to win some exciting prizes at the reception. All full electric and plug-in electric vehicle owners are invited to participate in the Electric Island Drive, and can officially join by signing up today at https://goo.gl/Em1Lty. Registered attendees report 13,200 electric miles driven.